The new music festival November Music that runs from 4-13 November will dedicate its last day to an ambitious ‘art music route’ through the beautiful city of Den Bosch. From 12 am to 6 pm short concerts are staged at various locations, where some of them are performed three times. Thus you get several opportunities to hear the pieces of your choice. In my 5 tips for the festival I already included two of these events, but here’s one more: Big Picture by the American-Dutch composer Vanessa Lann. It was written in January 2016 for the Storioni Festival and is inspired by the triptych Garden of Earthly Delights by Hieronymus Bosch. Bosch died 500 years ago and is a central figure in November Music. Big Picture will be performed by the Storioni Trio in De Toonzaal. Only once though, on Sunday 13 November at 4 pm. Vanessa Lann (New York, 1968) has been a composer and pianist since the age of five and studied composition with composers such as Ruth Schonthal, Earl Kim and Louis Andriessen. In 1990 she moved to the Netherlands. Lann likes to play with our expectations: ‘I’m interested in the path a listener follows, and in the dichotomy between background and foreground. This is rooted in my fascination for time and repetition. Often we concentrate on what draws our immediate attention, missing the things that are going on at a different level. How do we appreciate music when we hear it once, twice, three times or even more? At what point do we realize that what at first seemed to be the background, may well have been the core of the composition? Big Picture was a commission for the 20th jubilee of the Dutch Storioni Trio, that premièred it during their Storioni Festival in January 2016. 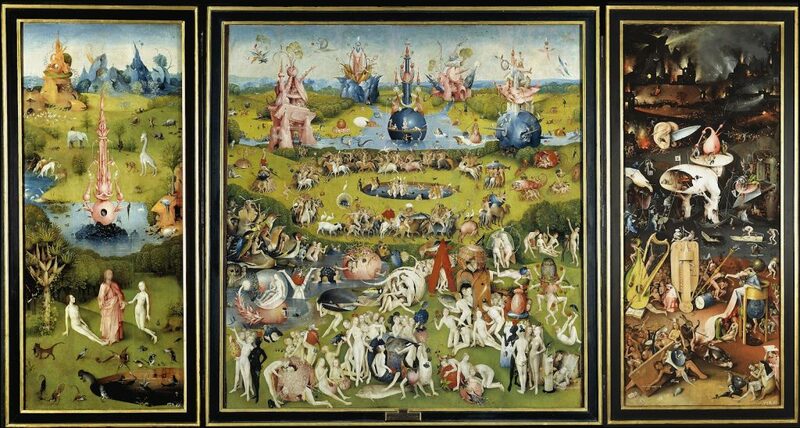 For what was to be her first piano trio, Lann enthusiastically embraced their request to reflect on Bosch’s hellish representation of the garden of Eden. ‘There are so many repeated images in the Bosch triptych that I’ve attempted to repeat elements in the three main movements of the piece’, she said in an interview. In Big Picture Bosch’s triptych opens itself up to the viewer/listener as it were, first displaying the overall picture that’s replete with naked people, water, outlandish animals and hellish creatures in multiple repetitions. The composer was fascinated by the question whether we focus on the details, or rather on the ‘big picture’, in other words: what is the foreground, what the background? After its première The Strad concluded: ‘The boundaries between visual arts and music are indiscernible.’ You can check out for yourself on Sunday 13 November at 4 pm in De Toonzaal, Den Bosch. This entry was posted in music, news and tagged Big Picture, De Toonzaal, Hieronymus Bosch, November Music, Storioni Trio, Thea Derks, Vanessa Lann. Bookmark the permalink.